The 12 gauge shotgun is a very effective self-defense tool for shooting events occurring at close range. This particular type of firearm is characterized by propelling several projectiles with each trigger pull, as compared to the single bullet per trigger pull that is typical of handguns and rifles. 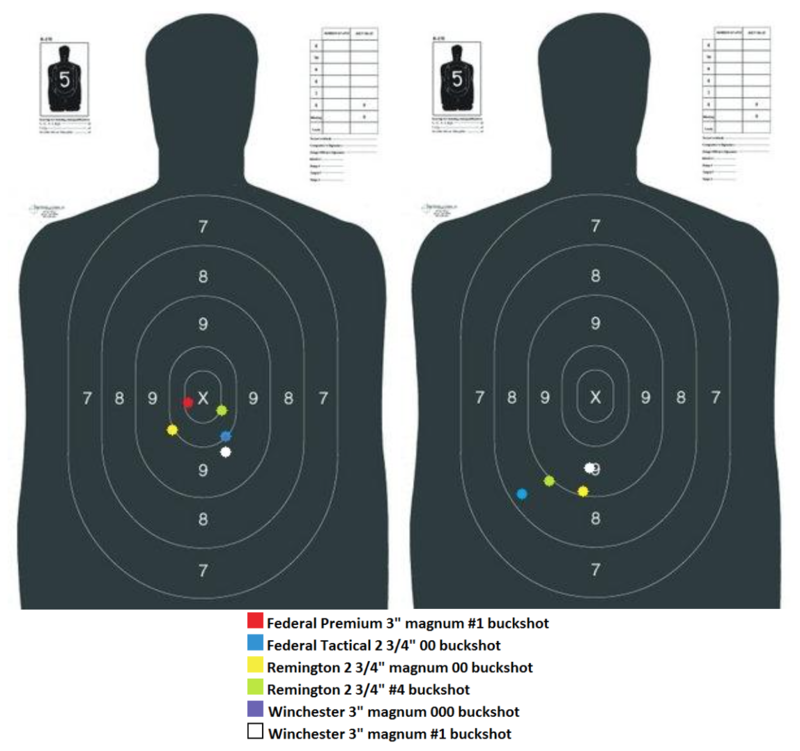 Multiple projectiles create the possibility of hitting and disabling a target on a shot with less-than-perfect shot placement which is common at night, with a moving target or when the shooter has limited training with firearms. The shot pellets that comprise buckshot are typically lead spheres with diameters ranging from 0.24” to 0.36” diameter. Upon firing, the spheres begin to spread out from one another and will continue to do so for the duration of their travel. This creates the “pattern” from a shotgun. It is this pattern that is addressed in this report, in an attempt to quantify the hit probability that can be expected from a given shotgun shell (fired out of a single test shotgun) and to illustrate the benefits of sighting in a shotgun to fire a particular shot cartridge. Additionally, the practice of utilizing only one particular load of shotshell (and the effects of the change in center of aim/center of impact if some other load is used) is also addressed. All of the cartridges were fired from a Benelli m4 shotgun, serial number Y018606. The Benelli m4 is a semi-automatic 12 gauge shot gun,with a Modified choke installed for the duration of the testing. This particular weapon was previously sighted in at 25 yards using a Federal Cartridge #4 buckshot load and the supplied iron sights. To provide a more consistent point of aim, a Bushnell Holo-Sight, serial number 240568, was carefully installed on the M1913 rails (while the weapon was mounted in a weapon cradle) such that the iron sight point of aim closely corresponded to the red dot point of aim. At round number 27 an internal mirror detached from the recoil, breaking the Bushnell Holo-Sight beyond repair. An Aimpoint Micro T-1, serial number W2423364, was installed in its place (using the iron sight POA as a reference) and used successfully for the duration of the testing. Targets were the NRA B-27 silhouette target, positioned at 25 yards and 50 yards distance from the muzzle. The point of aim on all shots was the ‘X’ symbol present at the center of mass of the target. Six types of ammunition were tested: Federal Tactical 12 Gauge 2 3⁄4” 00 buckshot (9 pellet); Federal Premium 12 Gauge 3” magnum #1 buckshot (24 pellet); Remington Express 12 Gauge 2 3⁄4” magnum 00 buckshot (12 pellet); Remington Express 12 Gauge 2 ¾" #4 buckshot (27 pellet); Winchester Supreme Double X Magnum Ammunition 12 Gauge 3" Buffered 000 Copper Plated Buckshot (10 pellet); Winchester Super-X Magnum Ammunition 12 Gauge 3" Buffered #1 Buckshot (24 pellet). 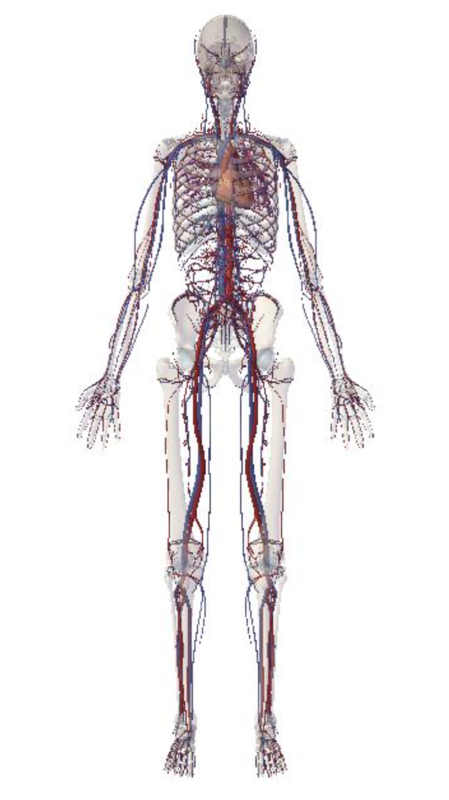 Figure 1 is the skeletal and circulatory system of the human body. While there is the possibility that a single shotgun pellet can disable an arm or leg, we focus only on the torso (as oriented above and depicted by the B-27 target) for this report as this is the target area that most people have been trained to aim at. Shots were physically taken to 50 yards distance, which some may consider to be an excessive amount for the loosely-constricted choke being used. It must be said, however, that one cannot pick the time and place of their self-defense shooting, nor the range involved. Shotguns are dominant at closer ranges, but all effort must be made not to limit ones shotgun shooting to rock-throwing distances only. It is assumed that a sphere striking the torso does so in a random, uniform distribution and as such can be considered an effective hit because deflection off of bones could lead a non-vital shot to becoming a fatal hit. The metric of success for a given load is determined as being a hit probability higher than 0.50 – that is, some factor of the firearm and cartridge interaction led to a more dense hit pattern than would have been produced by sheer ‘luck’. Figure 2 shows the center of the groups for all shotshells fired in this test. Note the horizontal shift of the loads as range increases. This denotes the necessity, if one were to sight in their shotgun for a particular load, to do so at several distances up to their desired maximum distance. Hit percentage can vary significantly from cartridge type to cartridge type when fired from the same weapon. We recommend choosing a shot size based on terminal performance at the realistic maximum range that your situation presents to you. The spherical shape of a shot pellet does not lend itself to aerodynamic efficiency, but it has the reverse advantage of rapid deceleration once it hits a fluid medium, which leads to greater lethality. As such, a pellet that performs optimally at 10ft distance will not perform optimally at 25 yards – it is very likely that the damage at shallow depths and overall penetration will be decreased due to the decreased kinetic energy at impact (as a result of aerodynamic drag working on the pellets). Once a desired shot size is found, it is recommended that several different brands and loads containing this shot size be tried out in your shotgun. Sight in your shotgun for a given load; an appropriate procedure can be found on www.BrassFetcher.com. Placing the target at your maximum anticipated range, fire several shots of each cartridge and select your desired load based on the greatest hit percentage of pellets on the target. This way, your shotgun will be optimized for your maximum expected range of engagement but also capable of throwing a more dense shot cloud, should you be engaged from a longer-than-anticipated distance.